Here’s where we’re going: If the hallmarks of cancer show us the “gates” that allow cancer to develop and the environment that helps it thrive, then our approach must be to counteract each and every hallmark. This is done through using the Word of God, prayer, envisioning the counteractions taking place, and worship. 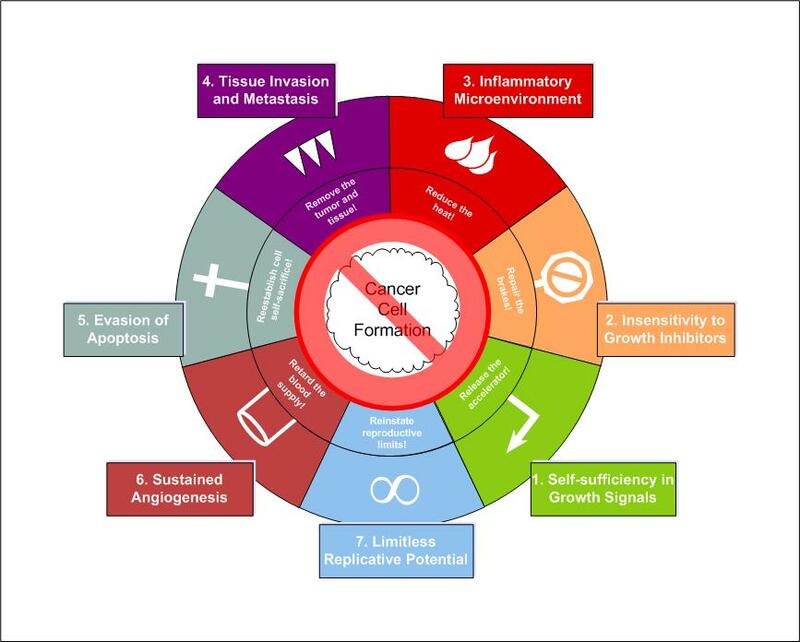 This drawing shows the medical approaches to countering each of the seven hallmarks of cancer. Typically, pharmaceuticals are developed that attack the hallmarks in the specific ways listed in the inner circle. There are, however, several inherent problems with pharmaceuticals: it takes a long time to get approval for a clinical trial, to conduct the trial, and then get FDA approval; the whole approval process costs hundreds of thousands of dollars. Also, over time the cancer cells develop an immunity to the pharmaceuticals that render them impotent. Are we without help or hope? Each of the seven elements in the inner circle is the spiritual/physical counterattack to overcome the corresponding hallmark. I will explain each counterattack in the future. 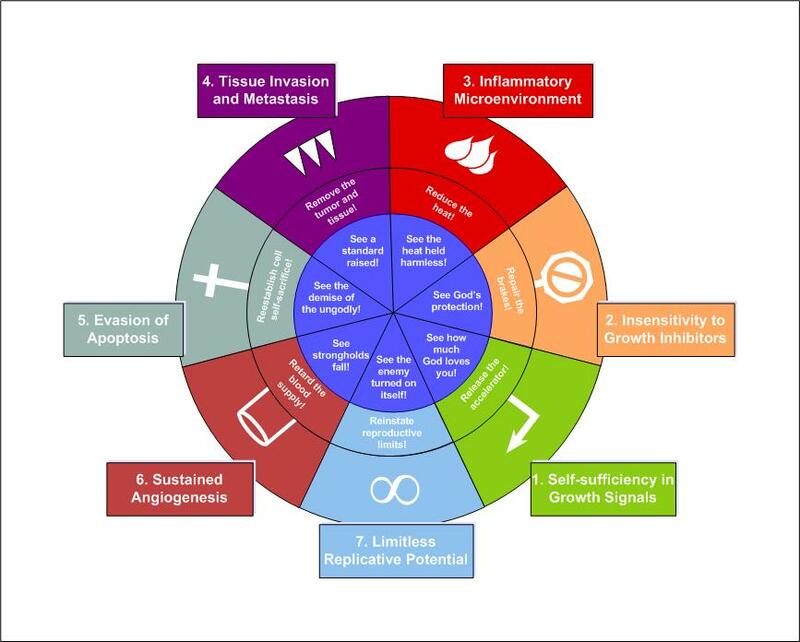 In the meantime, examine the diagram below and focus on each of the seven “inner circle” activities. The goal of each of these exercises is to thwart the development of new cancer and also shut down the growth of any existing cancer through spiritual means. I’m sorry I can’t get the drawing any larger at this time. Please double click on it to increase its size. 1. The Problem: Self-sufficiency in growth signals. The Cure: See how much God loves you. 2. The Problem: Insensitivity to grown inhibitors. The Cure: See God’s protection. 3. The Problem: Inflammatory environment. The Cure: See the heat held harmless. 4. The Problem: Tissue invasion & metastasis. The Cure: See a standard raised. 5. The Problem: Evasion of apoptosis. The Cure: See the demise of the ungodly. 6. The Problem: Sustained angiogenesis. The Cure: See strongholds fall. 7. The Problem: Limitless replicative potential. The Cure: See the enemy turned on itself. Many blessings as you turn your energies to seek God’s touch to restore normal, healthy functioning in each of these seven areas! Keep trusting Jesus. He is Faithful and True! In the near future, I will post the biblical basis for each of these counterattacks! Until then, stay in the word and keep trusting God. For more information, see our post (on our home page) “Overcoming the Seven Hallmarks: A Guide for the Christian with Cancer”.